Leftovers…I am way too tired to actually cook! OK, it’s New Year’s Day (officially) and I am TIRED! Considering all I did was stay home and watch movies with the family, you would think I’d be functioning better. I guess the drinks did not help! So after rolling out of bed at 1:00 or maybe it was 2:00 I found the energy to clean the kitchen, and make a cup of coffee then get caught up on my Facebook gaming…the internet fashion world is brutal! Miss a day and you’re last year’s news! So, having rebooted, somewhat, I’m realizing that I have to feed my husband and son. Thank goodness my dad went to my Aunt and Uncle’s for my uncle’s birthday celebration. HAPPY BIRTHDAY UNCLE CHARLES! Anyway, it seems that those grits were tastier than I recall, because there was barely a single serving left…which fortunately for me, was just enough to experiment with an idea I’ve had for a while, Shrimp and Grits Fritters, or balls…(giggle)…I saw something like this on an episode of Unique Eats, except theirs had ham and a piece of cheese wrapped in the grits, instead of being mixed throughout. Whenever I make my Shrimp and Grits appetizer, it is a big hit. So I came up with an idea to combine the shrimp with the grits, bread them, fry them an serve the sauce on the side, to make them more portable (for all of the drunk party guest). Because I also had leftover salmon, I combined the grits with leftover shrimp and salmon and added a bit more cheese. Can you say fat girl heaven? Fried grits…who knew this would be so good??? Apparently I did! I knew…something inside me just knew, this would be tastycakes! Both my sister and husband agreed… and my sister, who is never really big on the whole cooking thing, asked me to send the recipe…that means it’s a hit! So, without further adieu…I give you my Seafood and Grits Balls? Fritters? Dealers choice, call them what you want! Combine grits, cheese, lemon zest, shrimp and salmon in a bowl, mix well. 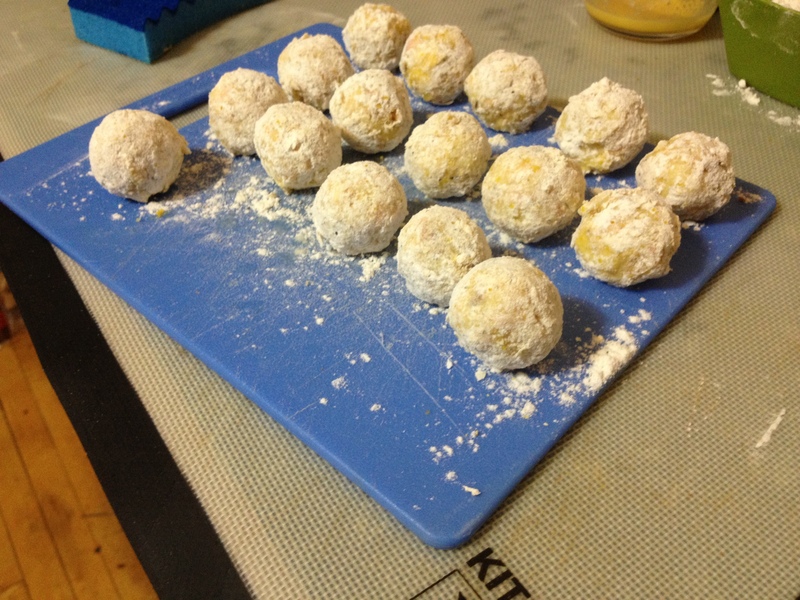 Using a spoon or small ice cream scooper, roll mixture into balls…(giggle)…I keep them about the size of a truffle. Mix flour and lemon pepper seasoning together in a small bowl. 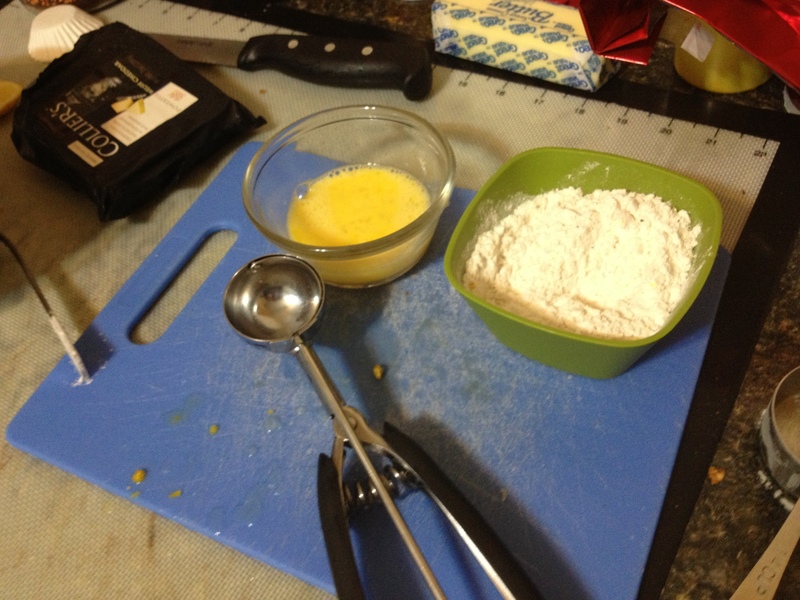 Using the “wet hand, dry hand” system, dip balls in egg mixture then coat with flour. Set aside on a plate or tray (or whatever you’d like!). Continue until all balls have been coated with flour. Refrigerate for at least 10 minutes. In a dutch oven or deep skillet, fill half way with oil (I use peanut oil, but canola or whatever you flavor is should work). Heat oil until it reaches frying temperature. I usually test this by dropping a small piece of bread (about the size of a dime) into the oil. If it browns, the oil is ready. 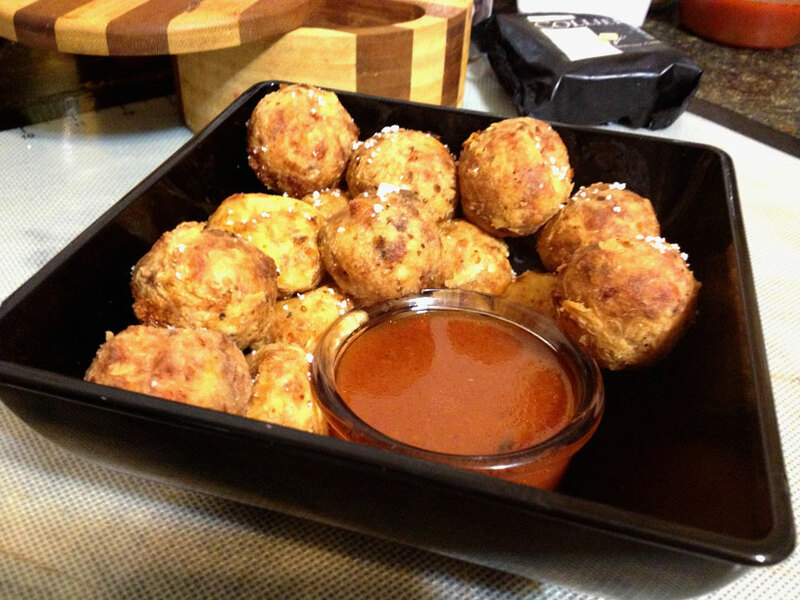 If using a deep fryer, place balls in fryer basket and fry for approximately 6 minutes or until golden brown. (I set the timer on my microwave for 6 minutes and they came out perfect). Remove from fryer and place in basket or on paper towel to drain. Sprinkle with sea salt (if you are so inclined) immediately after taking them out of the fryer. 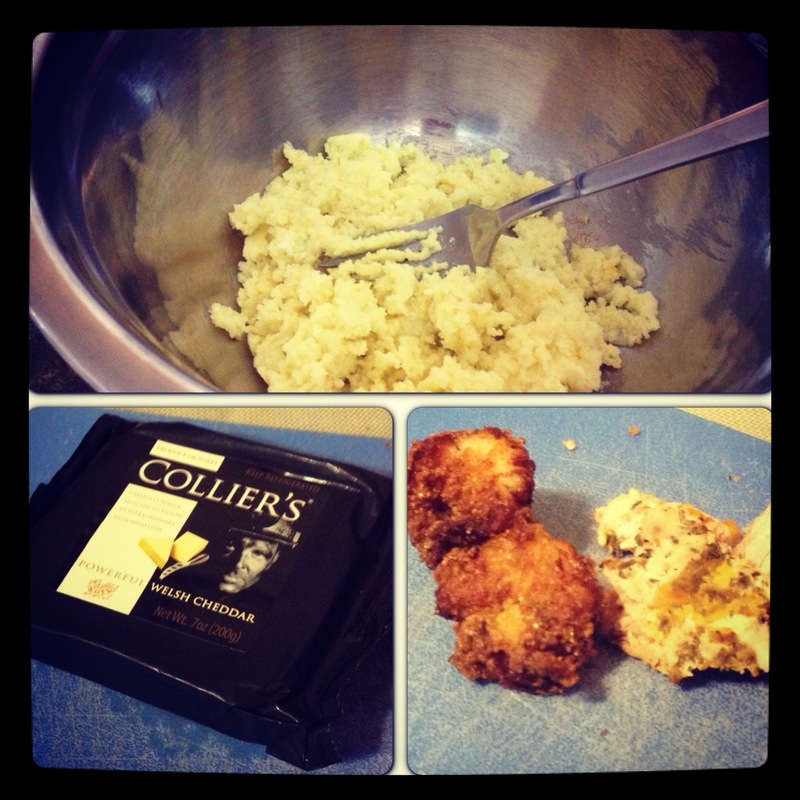 If using the skillet method, place balls in hot oil, and fry, turning as needed so that all sides are browned. Drain and season. Note: I served these with the sauce that I normally cook the shrimp in when I make Shrimp and Grits. However cocktail sauce or none at all should also work.